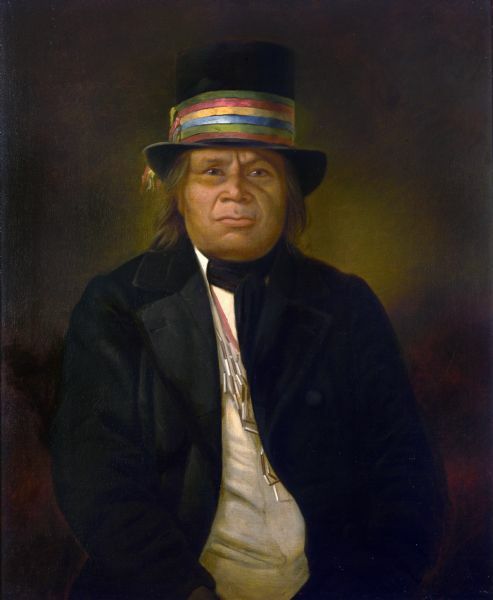 Oshkosh was a Menominee Indian chief who was tried in a landmark case in 1830 for murdering a fellow Indian. He was probably born in a tribal hunting camp on the Wisconsin River in 1795. During the War of 1812 he served with Menominee warriors on the British side at Mackinac, Fort Meigs and Fort Sandusky. He sided with the Americans in the Black Hawk War. At the treaty of Butte des Morts in 1827, Governor Lewis Cass recognized Oshkosh as chief of the Menominee. Three years later Chief Oshkosh was involved in a dramatic trial for murdering another Indian. Judge James D. Doty saved Oshkosh by ruling that under the circumstances, United States laws did not apply to Indians. Oshkosh signed treaties surrendering large portions of Menominee lands at Cedar Point in 1836 and at Lake Poygan in 1848. He later worked to adjust the provisions of the Lake Poygan treaty. He died on the Menominee reservation at Keshena in 1858. In 1926 his remains were reinterred at Oshkosh. See more images, essays, newspapers and records about Chief Oshkosh.